Have you ever craved a Big Mac burger but opted for something healthier instead? This recipe has been designed to make that Big Mac more alluring without the guilt that follows! Give our reduced fat Big Mac recipe a try! Create and prepare the reduced fat Big Mac Sauce Copycat recipe following this method. Cut the top off of the extra bun, leaving around 3cm of the bottom half of the bun, which will form the middle part of the Big Mac. Divide the ground beef into two thin patties slightly bigger than the buns. Cook both patties in a hot pan for 2 minutes on each side over a medium heat. Season with a sprinkle of salt and pepper. Lightly toast the three bun halves, either in a hot pan or a toaster. Then assemble your ready to eat Reduced Fat Big Mac by stacking the elements in the following order. 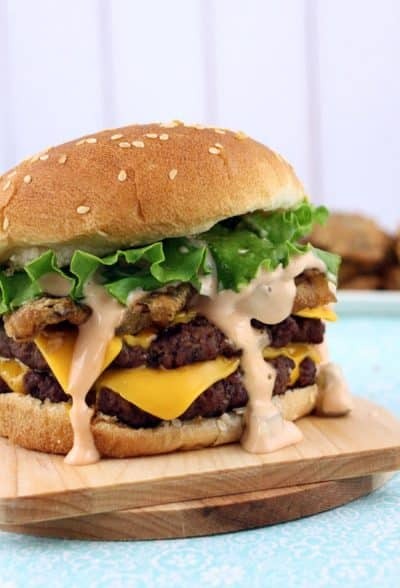 For our Reduced Fat Big Mac Sauce recipe click here.